TEXstyle Displays – also known as fabric displays – are contemporary alternatives to traditional exhibition stands. What’s the difference between TEXstyle displays and regular displays? Most exhibition stands use an aluminium scissor lattice frame that is dressed with magnetic graphic panels. The graphics are printed onto 505 micron thick stoplight media. They are then laminated and hook on to the headers and kickers of the frame. TEXstyle displays are made from stretch polyester fabric. Two pieces of fabric undergo an intense printing process and are then sewn together to create a one-piece fabric sock. This slides over the tubular, push-fit aluminium frame and zips up to stay in place, creating a falwless fabric display that is free of joins and seams. What types of TEXstyle display can I get? We offer a wide variety of Fabric Exhibition Stands, including the bestselling Formulate display range which includes the popular Straight Fabric Displays and Formulate Curve Stretch Fabric Displays. As well as Formulate TEXstyle displays, we manufacture Fabric Pop Up Stands in the form of Hop Up and SEG fabric exhibition stands. Hop Up Fabric Display Stands are unique because they incorporate a traditional pop up frame with fabric graphics. The graphics come readily attached to the frame with ultra-strong Velcro; all you have to do is pop the frame up and you’re done. You don’t need to detach the graphics from the frame when the event is over either, you can leave them on and pack up your display in seconds. Hop Up displays are printed using the same dye-sublimation printing process as other fabric displays which means the fabric still has the same amount of elasticity in it to dissolve any creases once the display is fully assembled. SEG Fabric Exhibition Stands are a different from the other Formulate displays because the edges of the fabric are lined with silicone. The silicone edging then slots neatly into the channelling of the frame of the display. The benefit of this is that you can create a super tensioned and taut fabric exhibition stand that showcases your brand in the best light. Aside from TEXstyle exhibition stands, we also provide a full range of Fabric Banners for those who fancy a change from traditional roller banners. The Monolith Fabric Banner is a great entry level fabric banner because it is available in six sizes and offers maximum portability at a cost-effective price. 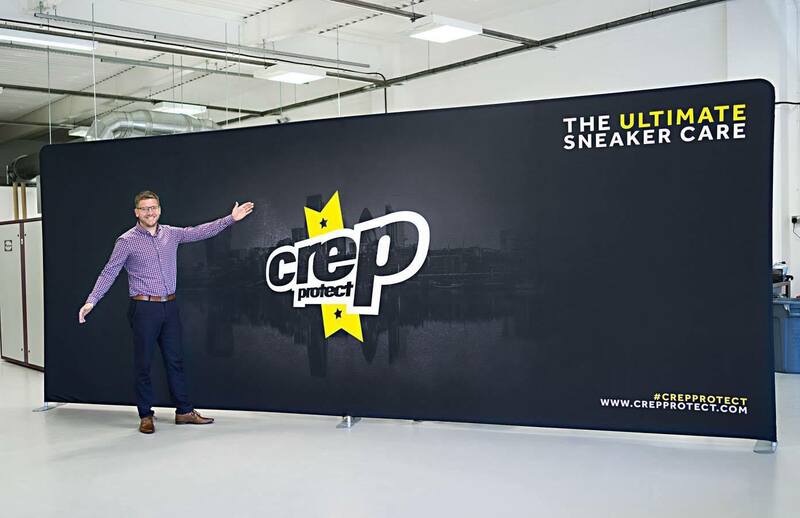 Alternatively, our basic Fabric Banner is a budget-friendly option that is ideal for brands who only exhibit once or twice a year and need a custom exhibition stand that can do the job without breaking the bank. For something a bit more dynamic, the Formulate Snake Fabric Banner features smooth curves and a freestanding frame. It offers the same impact as other fabric display stands whilst breaking up an otherwise flat exhibition stand. 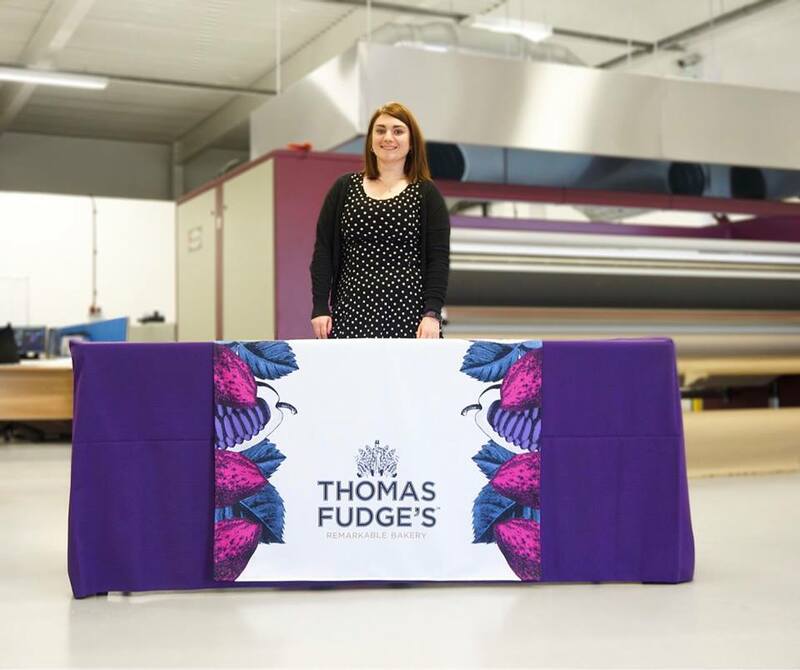 In addition, our fabric range is also home to a wide variety of Promotional Fabric Counters and Hanging Structures, meaning you never have to worry about forgetting an essential part of your exhibition stand because we have everything you could ever need. Why should I choose a TEXstyle display? There are many reasons why TEXstyle displays are growing in popularity, and almost all of those reasons stem from the printing process. As we mentioned earlier, fabric exhibitions are printed in a much more intense way than any other type of display. This method of printing is called dye-sublimation - a process that we do in-house. The graphic design for each display is always printed onto transfer paper first. The colours appear muted and dull whilst on the transfer paper; a look which can be deceiving. The transfer paper is lined up with the display polyester and both are fed through the Monti Antonio dye-sublimation calendar. This is where the magic happens. The Monti can withstand heat up to 200 degrees, and it pairs this heat with immense pressure as the paper and fabric are fed through the rollers of the machine. This combination of heat and pressure forces the ink from the transfer paper to bond with the fabric. When the fabric comes out the other side of the Monti, the colours are extremely vivid and bright – more so than with any other display solution. As a result of the ink being a part of the fabric instead of sitting on top of it, the risk of peeling, cracking and fading is eliminated. This durability is what makes TEXstyle fabric displays so popular; especially with brands who exhibit a lot and need an exhibition that can keep up. You can even wash your graphics at 30 degrees without any damage at all. As well as being more durable, dye-sublimation printing results in graphics that are of a photo-quality finish. The imagery comes out crisper, sharper and more detailed on TEXstyle displays which is a desirable attribute for any exhibition stand. There are many reasons why our customers choose us for their TEXstyle display stands. One of those reasons is that we are the industry leaders in event and exhibition solutions. We have over two decades of experience in this sector and supply the most comprehensive range available. We are extremely competitive on fabric display pricing; we offer double-sided printing at no extra cost. This means you can double your brand exposure without spending a penny extra when you come directly to XL Displays for your fabric exhibition. As well as this, we have a fully-fledged graphic design team who can help you to create a bespoke and original design for your display stand. If you already have your artwork then our graphics team will check it for free to ensure it is perfect for print. In addition to all of this, our staff undergo product training every other week to ensure they are the most knowledgeable and reliable in the industry. With a 9.8 rating from 10,000 TrustPilot reviews, it is clear that our customer service, product quality and pricing is is reliable and trustworthy. For more information about TEXstyle displays or the services we offer, please call 01733 511030.